Well for me personally, it is repurposed clothing and accessories. I LOVE the look of rag clothes with all mismatched fabrics! and I am SO loving cute headbands too! I ordered this one off Etsy. But for the girls... the latest obsession is playing in the cars in the driveway. I am talking about all out WAR from Gabbi Girl when I try to pry her from the vehicle in the evening. This one was especially fun. It was low to the ground and just their size! I'd borrowed JinJin's little sports car for the week. Remember the one she WON in a drawing right after Jake passed away on March 11th!! I think it was her little "thank you gift" from Jake. ANyway, in Louisiana, you can't really let kids play anywhere near a car unsupervised. If a door gets shut, it can get real ugly, real fast! It is sweltering down here! But playing on the hood of the car. Ok. Maybe! In the evening, when things are a weeeee bit cooler. Sorry, but I got Gabbi's number now. She has the best fake cry I have ever seen. I may need her to get her in the theater! She brings on the full crocodile tears and all! But if I kind of mimic her and cry too and start to grin, she can't help but follow suit. She realizes she's been busted at her own game! Oh no, here goes another one. Ellie crying is something we used to not see a lot of. Strangely, we are seeing more and more of it. Seems like THREE is coming in a lot more stressful than TWO! Oh please, LORD, give me strength. If Ellie has terrible threes and Gabbi has terrible twos, I am in for a whole mell of a hess! ANyhoo, summer's here. I am trying to push strappy sundresses as best I can. With Ellie going through her "I don't like dresses" phase, she has a new response. "Mom, I want to wear an ugly tank top." I think maybe she thinks they are called that. I have told her so many times, " Ellie, we don't need to wear an ugly tank top. Let's put on a beautiful dress." I totally feel your pain about the 'playing in cars' thing. Kids just don't understand how quickly that intense heat can overcome them. Scary stuff. We lock our car door so on one ventures in unattended. On a lighter note...lovin' the sun dresses. I'm a mix-n-match fabric lover as well. Glad my little girl hasn't been bucking wearing dresses yet. I am also a firm believer that the 'terrible twos' are really the 'terrible threes'...good luck with that one, Mel! They are soooo cute...even with crocodile tears! Love their dresses - love Etsy! I agree, and have said for years (my oldest is almost 17) that 3 is waaaayyyyy worse than any terrible 2. Keep on keepin' on, 'cuz you know we wouldn't trade them for anything in the world! Have an awesome day Mo! We had terrible three instead of two too! Good Luck! I feel your pain too! I have to tell you the 3 and 4 are way worse than 2! I thought I was out of the woods when my daughter turned 4....but no 5 is starting the same as 4! I could not imagine having 2 right now! 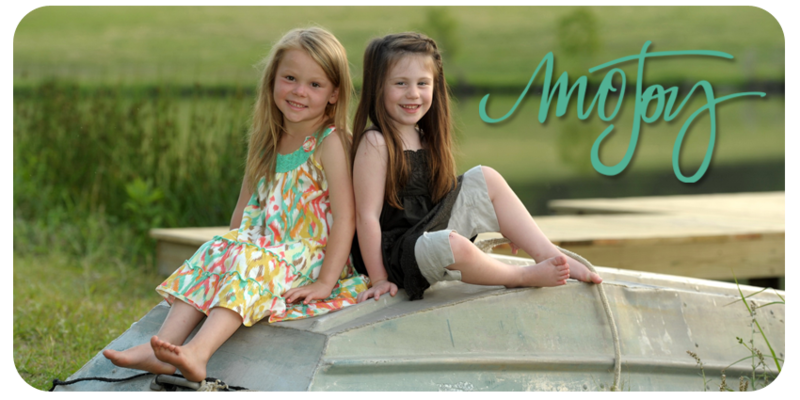 You need to check out Matilda Jane www.matildajaneclothing.com, You'll love it! Love those dresses! Will you post the etsy shop you got them from? Maddi is at the house today and I have to tell you-we've been sitting here at the computer for about 20 minutes looking at different blog posts. She is so animated when she tells me who is in the picture and sometimes what ya'll were doing. (Looking at river post she said, "Oh, I need my acorn back!") :-) I was just thinking what a fun time all those girls will have when they are older looking back at all of your posts! Missed getting my smile this morning. They just don't understand at work that I REALLY NEED to see my girls to get my smile going in the morning. Love the pictures and the little dresses. We have the opposite problem with my 3 year old. She will only wear a dress. But, she is very particular about the dresses. She does not like dresses that button in the back. This eliminates almost all smocked dresses. And, she does not like to wear bows! I LOOOOVE gabbi's dress...soooo cute!